For instant gratification in the sporosphilia (seed sowing) world, radishes are it. “Instant” is just three weeks from sowing to harvesting for some radish varieties like ‘Cherry Belle’. That really is fast, just 21 days. It takes three to four times as long for tomatoes and corn. And even a fast lettuce takes over a month, unless you cheat and harvest the leaves as ‘micro greens’. But on a level playing field, radishes are fast growers, as close to instant as you can get from sowing a seed to harvesting a crop from it. I sow seeds for my radishes in the early spring garden, along with peas, lettuce, spinach, and onions. Later, when I sow seeds for squash, I also sow a few radishes around each squash hill because radishes are supposed to ward off squash borers or something like that. I’m not sure if it works, but I do it anyway because if it doesn’t get too hot too soon, I just have more radishes to harvest and eat. Radishes, by the way, like it cool. As soon as it gets hot, they bolt and send up a big flower stalk, and then the roots are no good for eating. This year my goal is to plant the radishes in succession through the first weeks of spring so that I don’t have an entire crop ready all at once, but have enough at one time to make a good radish sandwich. I’ll probably eat it Texas-American style, like Annie in Austin, who was inspired by the Dutch-European version that Yolanda Elizabet made. ‘Cherry Belle’ – Like I mentioned, it is as close to instant gratification as you can get in the world of sowing seeds. The first ones should be ready to harvest in about three weeks. I always plant ‘Cherry Belle’. It's the standard radish, with all other radishes compared to it. ‘French Breakfast' – This was an impulse buy from a few weeks ago when I saw a big seed display at a hardware store. This one is supposed to take just 23 days to be ready to harvest. ‘Salad Rose’ – This was an impulse buy from a few weeks ago at the hardware store. This one will take about 35 days from sowing to eating and should be good for spring and fall sowing. ‘Watermelon' - This was an impulse buy from a few weeks ago at the hardware store. That must have been some seed display, to lure me in and cause me to buy three varieties of radishes. I should have looked more closely at days to harvest on this one because it is 60 days. That is a slow radish, a very slow radish. Around here, this might be one to sow in late summer for a fall harvest. I’ll probably sow it in the spring anyway to see what I get and then decide if I want to sow it in the fall, too. One packet of radish seeds usually includes 100’s of seeds, so I would guess between all four varieties I have 1,000 – 1,200 or more radish seeds. That’s enough for spring and fall plantings galore, a whole lot of instant gratification. Is anyone else growing radishes this year? oh yeah! I love radishes. I'll be planting Cherry Belle and White Icicle. I love French Breakfast too, but forgot to order those. Maybe I'll run into them locally. p.s. I think radish greens are good too, (and very nutritious,) sauteed, steamed, boiled, or added to a soup. I even like them raw - they add a nice peppery flavor to a salad, not unlike arugula. It seems to me that you had better avoid the hardware store for the rest of the spring or you garden will be nothing but radishes. Though I love radishes, it is nice to have something else to go with them. Do you eat the tops too? Radish top soup is tasty. Today is the first Divas of the Dirt project for 2009 - no idea what Diva Mattie has in mind but must go gather my tools. Hope you see that crocus soon! Love the radishes. Cherry Belle is one of my favorites, I also grow French Breakfast and Pink Beauty. The Pink Beauty takes about 29 days and really does well in the fall in my eastern Indiana garden. I have Plum Purple radishes. I have never grown them before. Anyone have experience with this variety? I am hoping to plant them in succession, starting soon. This weekend is rain/snow, so maybe sometime next week. I have never been impressed with the taste of radishes. I'm sure they taste better fresh from the garden, so perhaps I should try growing them. My dad loved radishes but I've never acquired a taste for them. Even he wouldn't have been able to eat 1000! I will also be planting a lot of cherry belle. nothing beats the kick of a radish. And like Gail, I love sowing some extra so I can pull them early to throw the sprouts on salads! We plan to grown a few radishes for salad this year, a variety called Cherriete. Hubby's the big fan, I just like them a little bit. Radishes are a staple in my outdoor garden but I started growing microgreens for my gardening quick fix. About 2 weeks from seed to salad. So far, I just have what I think is cherry belle planted in my first planting of the year. The label is off from last year's seed packet. 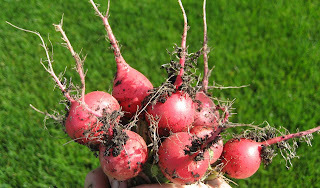 I meant to say more about radishes when I put my post up today, but I was in a hurry when writing it, and forgot again. I am one of those "cheaters" who eats my thinnings, so I do have some lettuce before the radishes are ready, but I do have to remember to keep an eye on them, so I can harvest them when they are ready. I usually also plant French, sparklers, and a huge kind, I can't remember the name of. Sometimes I put them right in the lettuce rows, but I have decided I prefer to just plant them in their own rows, close to the lettuce rows. My black thumb has caused us to have a pretty poor harvest, but it successfully allowed us to grow radishes!! I found the BEST Red Radish Salad recipe that's amazing... and super simple to prepare. I put it here on my blog http://gardeningwithoutskills.blogspot.com/2008/12/red-radish-salad.html If you're growing radishes, you've got to make this!! It's got dill and cucumber too...so if you can grow those too you're golden! How cool, Carol. I am trying Cherry Belle right now and was thrilled to hear how good they are supposed to be. And fast. We had several crops of French Breakfast radishes last year and just loved them. They were very tasty and easy to grow. I can't wait for my first crop this year. Good luck with all those. Thanks for the reminder to get some radish seeds in as soon as possible. I, too, will be trying successional sowing - I normally fail, and then they all start flowering as I haven't harvested them. Instant gratification is my neighbor who grows radishes. He doesn't eat 'em; just calls me to come and get them when they're ready. He grows a few veggies just because they are favorites of the neighbors. Is that a great neighbor?! !